Lobelia, also known as Indian tobacco, has been used against respiratory ailments for hundreds of years. Nowadays, science is discovering many other applications for this herb. Lobelia is an herb native to North America, where it has been used for centuries by Native Americans for coughing and chest pains, as well as for inducing vomiting. Today, lobelia is still used in herbal remedies; however, most people are unaware of its health benefits. Inducing vomiting. Its emetic properties can induce vomiting, which can be useful when needing to expel harmful substances from the body. Helping to expel phlegm from the respiratory system. Through its expectorant properties, lobelia promotes the secretion, liquefaction, or expulsion of phlegm from the respiratory system, which clears airways. Easing tobacco withdrawal. Lobelia may reduce the impacts of nicotine on the body and increase the release of dopamine, the drug that controls the rewards and pleasure center of the brain. For this reason, lobelia is often used to break the habit of smoking. Halting asthma attacks. Lobelia was traditionally used to treat asthma, and some traditional herbalists still use it for this purpose. However, there is no research that backs up this use. Lobelia contains fourteen different compounds which give it its medicinal properties, the most prevalent being obeline, gums, resins, lipids, essential oil, and lobelic acid. Of the numerous alkaloids found in lobelia, the most pertinent is lobeline, which directly stimulates the stomach, inducing vomiting. Lobelia's medicinal properties have also proven useful in reducing tobacco consumption by alleviating the negative effects of tobacco withdrawal. It is thought that its active compound, lobeline, binds to nicotinic acetylcholine receptors and may inhibit the blood-brain barrier (BBB) amine transporter. Lobelia also acts as an antidepressant by hindering cell proliferation in the hippocampus and inducing dopamine release in the brain. LOBELIA TEA IS NOW OFTEN USED TO HELP PEOPLE WHO ARE ATTEMPTING TO QUIT A TOBACCO DEPENDENCY. 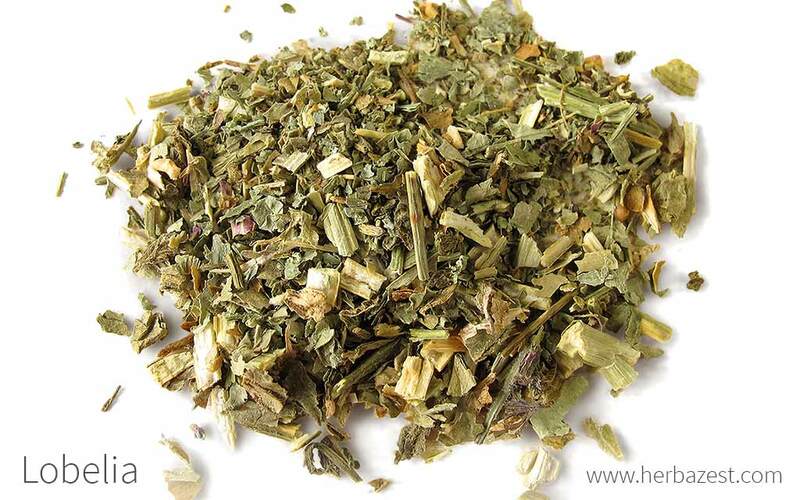 Herbs with expectorant properties are eucalyptus, myrtle and coltsfoot. Lobelia should be consumed under medical supervision, since it can be potentially toxic when taken orally. Side effects may include profuse sweating, nausea, vomiting, diarrhea, tremors, rapid heartbeat, mental confusion, convulsions, hypothermia, and coma. Individuals who suffer from high blood pressure, heart disease, liver disease, kidney disease, tobacco sensitivity, paralysis, seizure disorder, difficulty breathing, or recovering from shock should not take lobelia. Lobelia can worsen the symptoms of those who suffer from ulcers, Crohn's disease, irritable bowel syndrome (IBS), or intestinal infections. Women who are pregnant or breastfeeding should not take lobelia. The most effective way of obtaining lobelia's health benefits is through medicinal consumption, where quantities can be easily controlled. Lobelia can be taken by mouth or be applied topically. Infusion. As the main preparation, lobelia hot tea has numerous medicinal benefits, which include reversing water retention due to its emetic properties. It also eases withdrawal symptoms for those who are trying to give up tobacco products. Extract. As an extract, lobelia expels phlegm from the respiratory system thanks to its expectorant properties, clearing airways. Tincture. In this concentrated medicinal form, lobelia induce vomiting, relieving the symptoms of intoxication and poisoning. Ointment. Lobelia salves are applied topically in order to ease muscle spasms. Capsules. In this medicinal form, lobelia capsules can expel phlegm from the respiratory system through its expectorant properties. It also works as an antidepressant. Dried lobelia is available throughout the year through online suppliers and from some specialized health stores. Fresh lobelia is not as common, but may still be found in some of the more specialized health stores. Lobelia supplements are mainly found in specialized health stores. In addition, there is a wide variety of supplement choices available through online retailers. Each brand may come with a different concentration, so care should be taken in determining dosages. Lobelia, which can be either annual or biennial, is an excellent choice for decorating garden borders, window boxes and hanging baskets. It's a relatively easy plant to grow and thrives in cool, temperate climates. Lobelia plants prefer clay-based soil, and thrives in full sun or partial shade. Lobelia seeds can be sown directly in the garden or indoors for later transplanting, since they are vulnerable to the elements. Once they are established, lobelia plants require very little maintenance. They should, however, it should be watered frequently during periods of drought. For optimal growth, give them liquid fertilizer every four to six weeks. Flowers tend to bloom in the middle of summer. Scientifically known as Lobelia inflata, lobelia is an annual or a biennial plant that grows anywhere from 6 - 40 inches (15 - 100 cm) tall, with stems covered in tiny hairs. Lobelia's leaves are typically three inches (8 cm) long and are ovate and toothed. It has delicate and elegant flowers, which can be purple, pink, white, and blue. Lobelia is a member of the Campanulaceae, or bellflower family, comprised of approximately 2,000 species spread over 70 genera, and highly concentrated in the Northern Hemisphere. Lobelia inflata is the most popular species of the Lobelia genus, which encompasses about 360 - 400 species of flowering plants, including a significant number of large and small annual, perennial and shrubby plants that grow in a variety of habitats. While many of the Lobelia species seem dissimilar to one another, they can all be identified through their simple, alternate leaves and two-lipped tubular flowers, each with five lobes. The lower three lobes are fanned out while the upper two lobes are typically erect. There are numerous Lobelia hybrids, being one of the most well-known Lobelia speciosa, which is a hybrid of L. fulgens, L. cardinalis and L. siphilitica. For the majority of its history, lobelia was used medicinally in many different Native American tribes. The Cherokee tribe mashed up the root and dried the leaves, smoking the mixture in order to relieve coughing and chest pains. The Iroquois tribe used lobelia to treat venereal diseases, ulcers, and leg sores. The Crows used it for religious ceremonies. In the 18th century, lobelia was brought to Europe, where Samuel Thomson, a botanist and a healer, began using the herb for medicinal purposes, namely for treating fevers, rheumatism, and the common cough. However, Thomson faced great scrutiny over this practice, since lobelia is toxic when taken in excess, and was accused of murdering Ezra Lovette by poisoning, which he was later acquitted for. By the 19th century, physicians began recommending lobelia as a way to remove toxins from the body via vomiting. The United States remains the largest producer of lobelia, and the plant is commercially cultivated only for medicinal purposes. Britain is the largest market for lobelia, importing over 30 million pounds each year, though it is also popular in other parts of Western Europe. Insect repellent. The herb can be burnt in order to act as bug repellent, keeping away insects such as mosquitoes. Gardening. Some North American gardeners also grow it as an ornamental plant.